The Taylor 510e features a solid Lutz spruce top and solid mahogany back and sides, with a warm, dry response that responds beautifully to the touch. A slightly shorter scale length and V-carved neck provide a relaxed handfeel that makes it easy to bend notes and play difficult chords. Performance bracing complements the larger body and brings out the guitar’s deep, powerful voice. 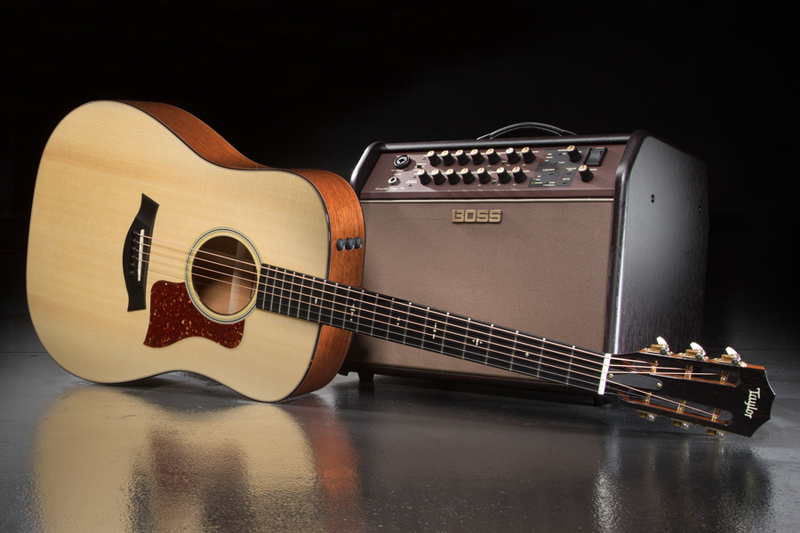 The 510e also comes equipped with ES2 electronics, nicely complementing the BOSS Acoustic Singer Pro amp. Taylor 510e guitar and BOSS Acoustic Singer Pro amp. The 2-channel BOSS Acoustic Singer Pro amplifier delivers next-level performance for serious acoustic players and singing guitarists, with innovative features and a true bi-amp design that delivers 120 watts of power. The guitar channel offers chorus, reverb, and an Acoustic Resonance feature, and the separate vocal channel features delay, reverb, and an auto-harmony accompaniment. A looper is included on both channels, as well as EQ and anti-feedback control, to keep you and your Taylor sounding your best. Between now and January 25, 2018, you can learn more and fill out the entry form here for your chance to win this dynamic duo. Good luck! Jordan West performing “More of Me” live on a Taylor 510e Dreadnought and BOSS Acoustic Singer Pro. TAYLOR GUITARS® 500 Series and certain of the distinctive details of the guitars are trademarks of Taylor-Listug, Inc. All Rights Reserved.